The bib is good quality made in the UK 100% double layer cotton pullover bib to help keep clothes dry and free from stains and is easy on and off pullover. 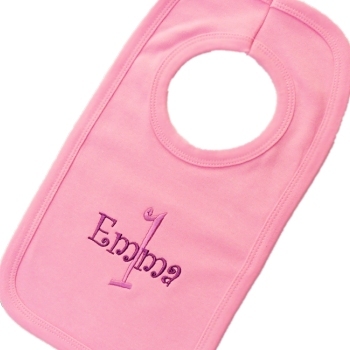 Bib colour available in White, Yellow, Pink, Blue, Red or Black. Please fill in the age number and name you would like embroidered in the boxes provided (please check spelling). Select a thread colour you want and we'll coordinate a second thread colour to compliment your selections. In our pictured example we used and magenta thread for the name and light purple for the age. You select a main thread colour and we will match a complimenting contrast colour. This bib also looks good with a name in black thread and initial in silver!